We have had a wonderfully positive start to the School year. It has been a very smooth transition to the new School and I have been delighted with the positive feedback from students and staff. As always, our students have been incredibly welcoming towards all new members of our community and have gone out of their way to make newcomers welcome. This past weekend was a momentous one for the City of Perth, as more than 1.4 million people came into the City to see The Giants. The event drew people from all walks of life together in an outstanding spirit of community pride. This led me to reflect on what it is that draws communities together. All too often this happens through tragedy or loss; however, events such as the festival this past weekend where people are able to celebrate and share positive emotions –excitement, wonder, or pride - has the same effect. I look forward to us developing the sense of community at St George’s in the same way this year, through shared excitement and pride as we work together to create a school that is innovative, dynamic and a model of excellence in all aspects. The students are looking very smart in their new uniforms and the staff have been very pleased with the uniform standards thus far. I do apologise to those parents who are waiting for some items of uniform. Unfortunately, some of our suppliers did not deliver on their promises and we are still waiting on certain items. We hope to receive these very soon. The summer dress and School hat have been particularly problematic, with items delivered that were different to what was ordered. We are working with the suppliers to finalise these as soon as possible. Parent Teacher interviews will be held on Tuesday 3 March from 1.30pm – 6.30pm. We encourage all parents to attend these interviews if possible, as it is a good opportunity to initiate contact with your child’s teachers. This year, parents can book their appointments online by following the instructions below. Click ‘Go’ to confirm your bookings. All parents and carers are invited to attend that Annual General Meeting of the P&F on Monday 23 February at 6.30pm in the Staff Lounge. We welcome participation from as many members of our community as possible. The P&F is a wonderful opportunity to meet other parents and become involved in the St George’s community. 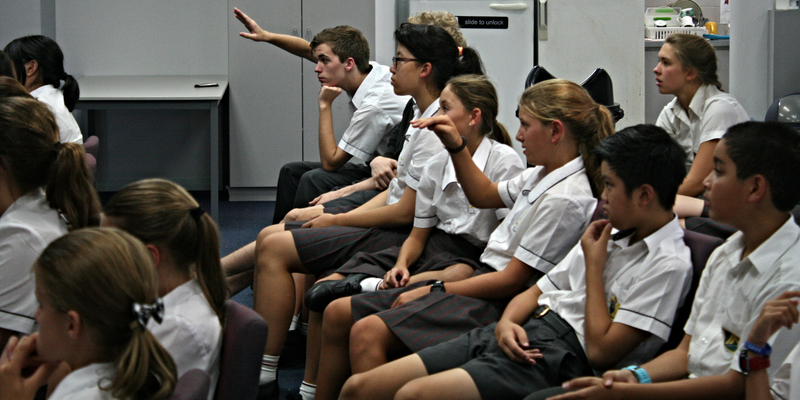 In July 2015 students from St. George’s AGS will have the opportunity to join with 6 other Anglican Schools Commission schools on the fifth Reachout to Manila. Participants will work alongside materially poor people in Manila - people who live in squatter camps alongside the rubbish dump and other marginalised areas of the city. The families who live in these areas have moved from regional parts of the Philippines to try and find a better life. They live in shanties erected on the side of the hill next to the rubbish dump. The parents spend their day picking through the rubbish finding plastic, metal and other items that can be sold for recycling. These camps are isolated from schools and other amenities, meaning that the children have very limited opportunities for education. The youth group of the local Anglican parish spends Saturday’s teaching basic numeracy and literacy to these children and giving them a meal. On Reachout Manila 2015 we will spend two weeks supplementing the efforts of local Anglican parishes by immersing ourselves in the communities; teaching, befriending and feeding the children; learning how to be present in the moment with another human being, to sit and be. We will be taken out of our familiar and comfortable lifestyles and placed into a whole new space of meaning, into cultures and environments that are in many ways alien to what we are used to. In these places we will have opportunities to serve and work alongside the ‘poorest of the poor’. Young people today want to have real and tangible opportunities to learn and grow. Through these tangible experiences, opportunities for growth emerge in a deepening understanding of ourselves, of God and of the world in which we live. We are in the fortunate position of being able to access many and varied resources in our city. Additionally, some of these are mobile; thus available to us on campus. 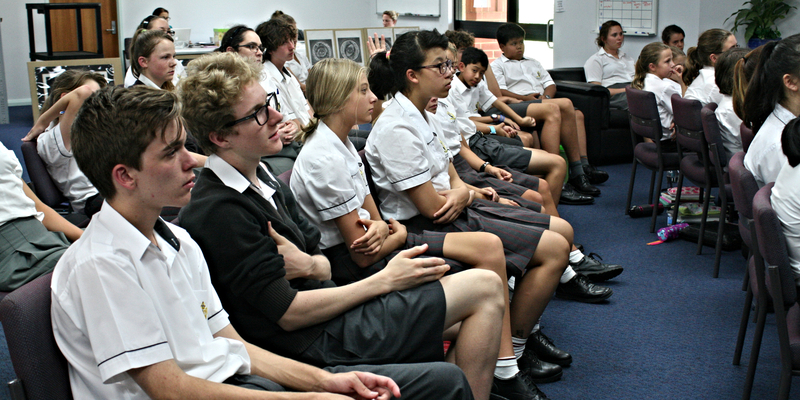 For the first time this year, St George’s Anglican Grammar School students in Years 7 to 9, and the Year 10 Visual Art students, had the privilege of participating in a picture book workshop conducted by Jenny Doust, one of the Education Officers at The Literature Centre. Through the generosity of the illustrator Shaun Tan, The Literature Centre has his original art works for the picture book, The Viewer. The book was written by John Marsden, in collaboration with Shaun Tan, to produce the powerful, if somewhat eerie, narrative. The fine detail of Shaun Tan’s illustrations provides an intriguing addition to the story. Rich in symbolism, the illustrations take more time and effort to read than the story. The students were quick to pick up the use of symbolism and imagery in the complex text. It is a joy to watch Jenny’s dynamic presentation, which engages students who respond enthusiastically. Their insightful contributions demonstrate their excellent understanding of how to read and make meaning of a visual text. I look forward to seeing the picture books that they are going to produce early this term. Jenny commented on the students’ willingness to participate, as well as the quality of their comments and observations. As expected, the students behaved with courtesy and respect. Please note there is a set down area next to the 'b block'. This stretch of road is clearly marked with signage. If parents could please refrain from dropping off and picking up their children in the slip road that says 'no standing' this will ensure our students are kept safe. We are excited to announce that Adobe Creative Cloud has arrived at St George’s! This industry-leading set of applications will further boost your child's’ learning & creative skills. The Creative Cloud suite will enable students to illustrate, animate, create special effects, photo manipulate and so much more. They will utilise popular apps such as Photoshop, Illustrator, Premiere Pro, InDesign plus heaps more! We are looking forward to seeing what our students produce with the implementation of this wonderful software! Due to the implementation of our new database the fee statements will be posted to all families very soon. Any parents who have nominated a direct debit will be personally contacted to finalise arrangements. We apologise for the delay in issuing the invoices. It is very important your child does not miss any WACE Exams during their final year! The written WACE Exams for Year 12 are on Monday, 2 November to Friday, 27 November. A Parent and Staff Sundowner will be held tonight at 6pm in the Quad. All parents are invited to attend. This is a good opportunity to meet the staff and other parents and carers. As alcohol will be served, students may not attend this event. The Sundowner will be followed by an information evening on the Reachout Pilgrimage for all interested parents commencing at 7pm in the YDC. Copyright © 2015 St George's Anglican Grammar School, All rights reserved.